2016-10 – Getting ready to leave Providence and make the move to Pittsburgh, where we've managed to buy an awesome old house. Lots of work ahead but its going to be fantastic! 2016-03 – Just finished a tour to Lubbock, TX and back on late Feb/early March 2016. 4136 miles of driving, 9 performances and 2 hot-spring vacation days in NM. Hours of documentation videos shot - you'll be seeing some of them here soon. Working on turning Massachusetts Geophonic into a standalone program for Mac and Windows. Will be available here soon. Still Working on a looping system in Max/MSP for solo performance that allows me to record and arrange loops on the fly to create distinct sections and different textures. It's become quite a beast over the last year i've been working on it. A new version of Maestro Frankenstein is in the works and will be released sometime. It is a complete re-write with a much better GUI, better performance, and hopefully far fewer bugs. It may not have all the features of version 1 when first released, but i hope to add all the reasonable ones back as I go. Playing in this awesome new band. Played in a music and dance adaptation of John Zorn's Cobra [video]. Oleophobic - live at Pixilerations from Arvid Tomayko-Peters on Vimeo. 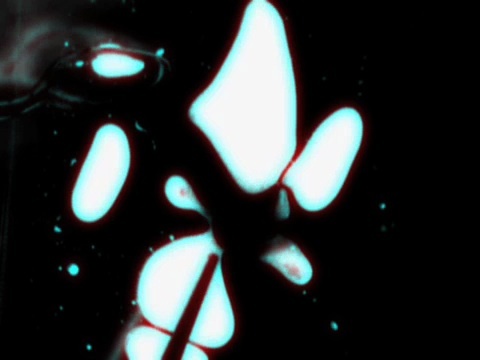 3/25/2010 - My current Project: video tracking water blobs in oil to make live music. We manipulate the blobs of colored water in oil between a pair of membranes and track them. Their positions and sizes control ambient additive synthesis and also define the notes played by a looping sequencer with a playhead that travels from left to right, playing blobs as it encounters them using their height and size to determine note parameters. Here's a work in progress video - try to see if you can connect the patterns of the struck notes and the ambient background to the blobs in the video. Also - More Video. 5/24/09 - Josh Marshall and I have started a group called Modest Machine. We do an all-improv Electro-Jazz-Fusion Miles Davis kind of thing. We play every other Tuesday at Tazza. 11/11/07 - I've been playing with Metropolis lately - making people in Providence dance! We play Psycho-Electro-Acoustic-Islamo-Judaic-Dance-Surf-FreeJazz-Metal Groove Music. Contact me (email at the bottom of the page) if you want us to play. 6/8/07 - I was on Living on Earth on NPR and PRI radio stations! Read and listen on the Living On Earth site. 4/21/2007 - Christie and I performed for Jim Peters' opening at Pierre Menard Gallery in Cambridge, MA on Thursday. Much fun! Listen to the recordings of two of the pieces. Also I have a good 5 minute video of Climate Controlled up! 4/12/2007 - Climate Controlled went fantastically! I am still putting the documentation together for it, but there is some up already on the geophonics page. starring, among other talents, the fantastic Christie Gibson! Also, I went to the Grand Canyon, Zion and Bryce with Brown Geo and had some awesome (but cold) camping and hiking adventures. Photos soon. I'm performing at two openings on two thursdays: tonight at Brown and next week in Cambridge for my father's opening. My Honors Thesis geophonic installation will be up at Brown March 19-22! For more details and to see opening hours, go to the Geophonics Projects Page. 2/7/2007 - New page and demo video/audio for my geophonics thesis project. 1/9/07 - Maestro Frankenstein 0.25 is released as a Universal Binary - no longer is it a separate download for PPC or Intel Macs. 1/7/07 - Happy New Year! And a new release of Maestro Frankenstein that puts the whole interface in one nice window and fixes some nasty ole' bugs. Also, check out Butter's website - I just helped Eric and Maryalice to get it up and running with podcasts of their tunes and more. Dec 2006 - Christie and I went to New York and played at a party in Tribeca. You can hear our piece, Arvid+Christie=heartheart, on the music page along with LOTS of other new and old music I have just uploaded. Also the Brown New Music Concert Aural Fixation (a.k.a. Kristmas mit Karlheinz) was a success! Masters of the recordings are nearly done. 12/2/06 - I'm designing the new Brown Opera Productions Website - check it out! 11/29/06 - MEME Ensemble performance at the Hellgate Social in Astoria, Queens was a blast! Butch Rovan, Kevin Patton and Fred also played with some of their friends. 2006/11/14 - New bugfix version of Maestro Frankenstein, the Geophonic Music Application released (0.22 beta). I fixed an annoying little graphical bug. Mac versions (PPC and Intel) are available now, Windows version coming soon (as usual...). 2006/11/12 - Happy Exploding Whale day! "The Blast Blasted Blubber Beyond All Believable Bounds". Today is the anniversary of the Exploding whale incident, which occurred in Oregon and 1970. Check Out the Video and the Wikipedia Article. May your day be just as explosive. In other news, check out the MacUpdate pages for my software! Maestro Frankenstein and Frogmeter! 2006/10/13 - Pixilerations [v.3] closing concert was great. I played with the MEME Improv Ensemble. Lots of other digital and electronic media acts and cool installations. Location: 191 Westminster St, downtown Providence, RI [Google Map]. 2006/10/2 - Maestro Frankenstein 0.2 beta is released for Mac (both PPC and Intel)! Download it and make music from data! 2006/11/11 - New bugfix version of Maestro Frankenstein, the Geophonic Music Application released (0.21 beta) and wiki launched for documentation! A number of bugs have been fixed. Mac versions (PPC and Intel) available now, Windows version coming soon. 2006/11/2 - New dynamic news content system! Wheee! 7/25/06 - I am in Italia at the moment living at Coldigioco and working at AEA on Maestro Frankenstein - a multi-track sequencing application to create music from geologic, or any type of scientific data! Stay tuned for a release in the next few weeks - possibly. Saturday April 15, Brown University Main Green - Brown New Music performs Terry Riley's "In C" outside for about an hour! Saturday April 22, 8pm, Grant Recital Hall, Brown University - Brown New Music Spring Concert! Saturday April 15, Brown University Main Green - Brown New Music performed Terry Riley's "In C" outside for about an hour! What a host of musicians! Thursday April 13, 9:15-10pm, The Underground in Faunce House, Brown University - Jamnesty International: I made noise with Demetrius Harrington and Hank Kaplan. We were be lovingly loud. Recordings will be available soon. 4/9/06 - Time passes, it does. Lots of new images. 4/2/06 - Put up two new tunes on music page. Back from Geo Dept trip to TeXas! (Big Bend, Guadalupe Mtns and Carlsbad Caverns) Spectac. Hiked a lot in the desert and mountains. Cacti were plentiful. Photos to appear soon. 2/12/06 - My birthday and a new homepage design! The site will be slowly transitioned to this new design, one page at a time, as I find the time. 1/24/06 - Happy New Year! I am back from spending the first part of the month in India with my friends Shveta and Tamilla! It was fantastic, except for the part about getting mugged and then hospitalized for acute gastroenteritis in Bombay. Just amazing. There are a bunch pictures in the images section! Check 'em out! 12/18/05 - Sensory Overlord came off great. Afro-Latin Jazz concert was cool. I am done with school for the semester and I am anticipating some great time off. 11/8/05 - Pixilerations was awesome. I am in the Projo! Now I am trying to build a tent performance with a group. We call ourselves "Sensory Overlord". More on this later, when (if) I ever get some time! 9/19/05 - back at school! Taking some great courses. Over the summer I a finished my most ambitious website yet for Jon Friedman, made image galleries for the artSTRAND website, created their inventory/mailing list/sales database, made some short videos, and performed and recorded a 40-minute improvisation with Eric Peters and Maryalice Johnston at artSTRAND using digitally augmented trumpet, guitar with effects, keyboards, mandolin and various noise makers. 6/24/05 - Website larybloom.net finished for Connecticut writer Lary Bloom. More new music up! I am playing some crazy trumpet stuff at Brown Amnesty International's "Jamnesty" - This Thursday Nov 10, at 8-11 PM at the Hourglass cafe (at Brown). This should be a cool show with skyrocket and a number of solo acts playing including Ben Ewing, Amy Robinson, Samuel James, Henry Freedland and myself! For those of you who would like to hear some electronic Amphibious Destroyer Trumpet craziness, I think I will be going on around 9ish. The Amphibious Destroyer Trumpet is a trumpet with motion tracking (via an accelerometer) and digital controls that allow it to interface with custom software and create lots of horrible (beautiful) noise (music). The software includes pitch, rhythm, tempo and attack tracking and accompanies the player. All electronic sounds are generated 'in situ', either as realtime effects, mangled samples from trumpet sounds played earlier in that performance, or by a synthesis engine that attempts to mimic timbre characteristics captured from the trumpet's acoustic sound. Performances are completely improvisatory, but have been known to have some overarching structure. May 23, 2005 - Back home. Major update to and reorganization of the free music software guide and new music from the crossroads ensemble concert coming soon. Enjoy! Monday, May 9, 8:00PM - Crossroads Ensemble semester concert featuring original compositions by bandmembers (including myself) and the voices of Soul Cypher dropping some hip-hop verses. Location: Rites and Reasons Theater, 155 Angell St. Providence. 4/29/05 - Site update - New listing of upcoming concerts! Brown MML Cyberarts Online Gallery, including some of my work, goes online May 1st! 10/12/04 - Small update to Audiounits section of Free Mac Music Software Guide. I have been getting some wonderful visitor feedback! Thank you! 7/16/04 - Got Logic Pro! Yippee! (Logic + MaxMSP)/Jack = Infinite possibilities! Also working on updating website for DNA Gallery, a Provincetown art gallery. 6/19/04 - New domain name for this site! arvidtp.net is now up! The old address will still work also. 6/14/04 - Free Music Software Guide update. I am now available to do web design. 6/11/04 - Minor site updates. Performance this Saturday in Dennis, Mass for a wedding - playing in a conch shell trio! 5/31/04 - Intervals 0.4 beta is out! - includes more features and a greatly improved interface for your ear training pleasure! Thanks to Marc for testing/feedback. 5/25/04 - Henry's Beard, my performance with the percussicube, went great. I finished finals after a great year at Brown. I'm back home now on Cape Cod, got my studio set up, etc. Good to be home, but I miss my pals and a wonderful girl. More site/software/music updates and a website for my mother and her art are soon to come now that I have a bit of time. 4/17/04 - Percussicube development proceeding nicely. 4/14/04 - Minor site update, more Percussicube info, info on my web design, teaching and mac repair abilities. May 7th: Brown Jazz Band concert featuring tenor sax player Joe Lovano! 3/31/04 - Back from Rome! Wow was that an amazing week. We played at a hotel and a prison and some of us jammed at a club with some crazy guys. Did all the tourist stuff - Vatican, Ruins, Catacombs, Food, Gelato, wine. Ok, now back to work. 3/18/04 - Off to Rome with the Brown Jazz Band on Wednesday! Be there for a week! YES! Also check out the progress of my instrument. 3/7/04 - Intervals ear training software and new versions of my elastic audio Bidule instruments are available for download here. Jazz concert went really well! 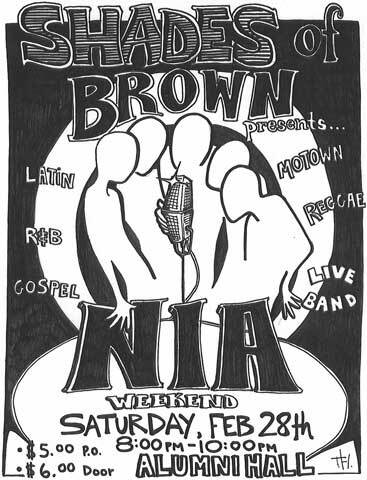 3/1/04 - Saturday night's SHADES OF BROWN show was great! Brown Jazz Band concert this Friday the 5th, 8 pm. I am taking an awesome seminar class with Professor Curtis Bahn called "Composing and Improvising with Extended Digital Instruments". I am creating my own instrument. I have posted here information about my new digital instrument project. Also I have made some small music software guide updates, etc.